Cosmonaut Valentina Tereshkova, who in 1963 became the first woman to fly in space, lights the 2014 Olympic Games cauldron in her hometown of Yaroslavl, Russia, on Oct. 19, 2013. Cosmonaut Valentina Tereshkova, the first woman to launch into space on a rocket's flame, took ahold of the Olympic flame Saturday (Oct. 19), completing a leg of the 2014 Winter Games' torch relay. At the same time, an unlit torch to be used in the Olympic Games' opening ceremonies was being readied for its own trip, first to its launch site and then into space. "Today we have a very important day," Tereshkova said, according to a summary published by the Olympic Winter Games organizing committee. "The Olympic flame arrived in Yaroslavl — and it is a symbol of courage, purity and the struggle for the victory." "In space, we have to hide emotions far, far away because of the responsibility," Tereshkova remarked. "Today there were emotions, but the main thing was not to let down the people who trusted me with this role." Saturday marked the 13th day of the cross-country torch relay. The procession started on Oct. 7 in Moscow's Red Square and will continue until Feb. 7, when it will reach the Black Sea coastal city of Sochi to take part in the opening ceremonies for the 22nd Olympic Winter Games. This was not the first time that Valentina Tereshkova participated in an Olympic torch relay. In 2008, the first woman in space ran with the torch for the Beijing Summer Games, carrying the flame through St. Petersburg, where the 2014 relay will arrive on Oct. 27. 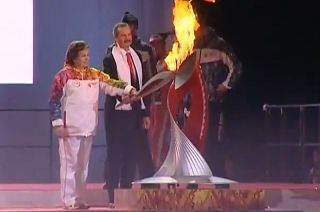 Tereshkova said on Saturday that she would have liked to have flown with the Olympic flame into outer space, "but unfortunately that's not up to me," RIA Novosti reported. The flame may not be headed to orbit, but a torch that will be used in the Sochi opening ceremonies is space-bound. The aluminum red and silver unlit torch, which is similar to the 14,000 others being used in the terrestrial relay but for the addition of an extra tether, is arriving Monday (Oct. 21) at Russia's Baikonur Cosmodrome in Kazakhstan, where it will launch with the next crew for the International Space Station (ISS) on Nov. 6 (Nov. 7 local time). "The torch is ready, it will be delivered to Baikonur on the 21st of October," Yuri Pokidov of RSC Energia told Oleg Ostapenko, the newly-appointed chief of Russia's federal space agency Roscosmos, during a tour of the launch site on Saturday. The torch, which is arriving by cargo plane, will be packed on board the Soyuz TMA-11M spacecraft on the day of its launch, Pokidov said. The Olympic torch for the 2014 Winter Olympics in Sochi, Russia will go where no torch has gone before: out on a spacewalk from the International Space Station. Six hours after lifting off from the Baikonur Cosmodrome, the torch will be carried on board the space station by the Soyuz TMA-11M crew, cosmonaut Mikhail Tyurin, NASA astronaut Richard Mastracchio and JAXA astronaut Koichi Wakata. It will be only the third Olympic torch in history to fly in space and the second to enter the orbiting complex. Two days later, it will go where no Olympic torch has gone before. Once handed off to space station commander Oleg Kotov and flight engineer Sergey Ryazansky, the torch will be taken on a spacewalk Nov. 9, where live video and photographs will document it floating above the Earth. "Nobody has done this before," Dmitry Chernyshenko, the president of the Sochi 2014 Organizing Committee, said in a statement. "The spacewalk by two Russian cosmonauts with the [Olympic torch] will be a historic moment in the history of the Olympic Torch Relay." The torch will return to Earth on Nov. 11, landing on board the Soyuz TMA-09M capsule with Roscosmos cosmonaut Fyodor Yurchikhin, NASA astronaut Karen Nyberg and the European Space Agency's (ESA) Luca Parmitano. Three months later, the space-flown torch will enter Fisht Olympic Stadium in Sochi to begin the Winter Games.